(Left to right) Jurors announce the Pao vs Kleiner Perkins decision. Jimmy Fallon rehearses. A tragic fire erupts in NYC. Chris Hadfield describes how spacesuits work. Aaron Paul being awesome. Chris Sacca shares a special gift. A beautiful sunset. President Obama boards Marine One. BT practices on piano. David Guetta spinning. The fire in NYC from another angle. A rainbow in New Zealand from Trey Ratcliffe’s house. A glimpse of Bora Bora, and a sunrise from a hot air balloon in Cappadocia. We launched Periscope a week ago and have been overwhelmed (in the best possible way) by the outpouring of excitement for the product. We built Periscope to let people discover the world through someone else’s eyes and in just a matter of days have taken us all around the globe — to nearly every country in the world. The US Dept of Interior took us on a tour of the National Mall and a Glacier National Park ranger showed us the stunning wilderness and answered questions. Christopher Miller gave us a glimpse into Ukraine. Aaron Paul took us to his living room to listen to an acoustic performance by Jack Garratt. Jimmy Fallon brought us to the set of The Tonight Show to watch his monologue rehearsal. Benjamin Millepied took us backstage at the Paris Ballet to watch Swan Lake and inside ballet class at the Paris Opera. Italian Opera legend Massimo Giordano sang to us and Wendy Macnaughton showed us how to paint a flower. And many, many more of you have given us a fascinating glimpse into all sorts of experiences and events, from a car chase in Los Angeles to a church service in Tennesse to a conversation about Bitcoin. And, of course, many of you have shown us your fridge. What?! “Woah with the notifications!” We hear you, it can get noisy. We switched the default setting off for follower notifications and know we need to make the overall controls here more granular. We’re on it. “It’s hard to sift through the live feeds.” Totally, we agree. As of our latest iOS 1.0.1 update, live broadcasts from people you follow will always be at the top. We’re also introducing a ‘Featured’ section to highlight unique content. “The location sharing is too revealing.” You don’t have to share your location publicly and can turn this feature off anytime before broadcasting. But, when you do choose to show your location, we’ve changed the map display so it’s further zoomed out and less precise (in the latest 1.0.1 version). “My broadcasts aren’t being tweeted” Try this. “When is Android coming?” Soon! We’re working on it. Suffice to say, you’ve kept us up all night with your creativity. And, kept us up all night trying to keep our servers running! 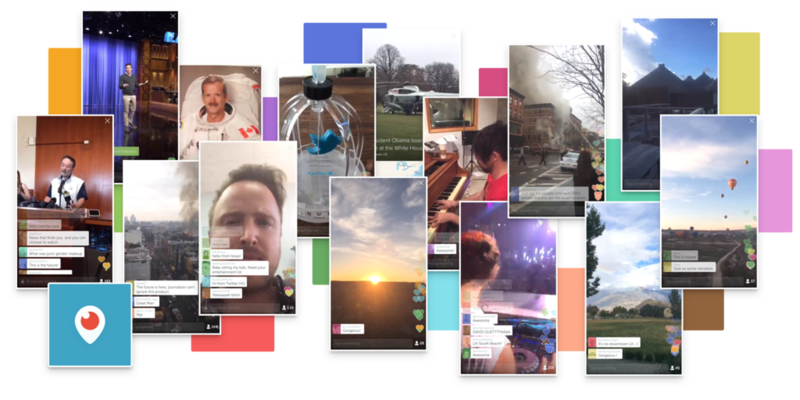 Thank you all for bringing Periscope to life. Thanks to Katie Jacobs Stanton.